PICTURED: 58-year-old Anthony Avella and his dachshund. BEVERLY HILLS, Florida (WPVI) -- A man in Beverly Hills, Florida, was arrested after he allegedly used a handmade tool similar to a coat hanger in an attempt to remove pork bones from his dachshund's intestinal tract. 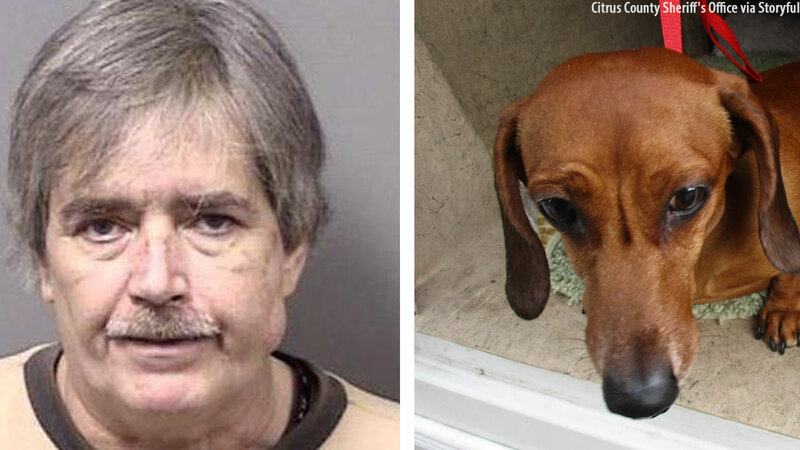 Police say 58-year-old Anthony Avella took the dog to a local veterinarian when his attempts to remove the bones were unsuccessful. The veterinarian noticed the dog was under extreme stress and recommended Avella take it to an advanced care center for treatment. The Citrus County Sheriff's Office and animal control officers check on the dog's condition at Avella's house. They found that the dachshund has still not been treated. Avella was arrested and charged with two felony counts of practicing veterinary medicine without a license and causing cruel death, pain, and suffering to an animal, according to local reports. The dog is currently receiving around the clock emergency care from local animal control officers and expected to recover from his injuries.